Lee Selby has a flaw. When he throws his straight right hand, he slows the punch down, trying to place it perfectly. The punch is released at about three-quarters speed. Thus, after throwing a quick jab, the right hand is more deliberate. Josh Warrington was well-prepared for this quirk and whenever he saw the right hand coming, he would beat Selby to the punch with a counter left hook, or slip the right to throw a double left hook combination to Selby's body and head. This pattern manifested throughout their fight on Saturday. It was thrilling to watch Warrington exploit Selby's bad habit. One could almost see him licking his lips when the right hand was coming, knowing that he was about to land a couple of uncontested blows. Here's Sean O'Hagan, Warrington's head trainer, in the lead up to Saturday's fight: "What I will say is that you prepare for the fight in front of you. We're preparing for Lee specifically. This camp has been so relaxed. It's flowed so well. There's been no flaws. We're all very relaxed." That sounds like a team that did its homework and was supremely confident in its ability to exploit Selby's technical shortcomings. Even though Warrington was a significant underdog coming into the fight (4-1), he approached the bout with the confidence of a seasoned champion, not as the first time title challenger that he was. Warrington fired power leads and counters with little regard for what was coming back. And there's a reason for that: He knew that Selby couldn't hurt him. Because of Selby's lack of power, Warrington could afford to exchange in the pocket and take a few shots to land his best. Certainly Warrington was amped up fighting in front of his hometown Leeds crowd, and that could have enhanced his feeling of invincibility. But it was more than just raw emotions that led to his victory (a split decision, but in reality he won at least eight rounds). He had the tactical and strategic plan to win; he executed it beautifully. Selby fought hard. He had to overcome cuts over both eyes. He had rounds where he was able to put punches together effectively, but his technical flaw and lack of punching power would herald the end of his featherweight title reign. After the fight, Selby announced that he would move up to 130 lbs. He believed that his difficulty in making weight negatively impacted his performance. But Selby's problem on Saturday wasn't conditioning, effort or punch volume. He was beaten by a better prepared fighter and a superior corner. Selby held a world title belt for almost three years, but with very little to show for it. Despite employing Eddie Hearn, Frank Warren and Al Haymon, he was never able to land big fights, or show enough against lesser talents to create significant demand for his services. I don't see him becoming a major factor at 130 lbs., but boxing is a funny business. Stay in shape and train hard and who knows...on his night he could come again. Like Selby, Warrington lacks world-class power. He's a tough and determined fighter but he doesn't feature a true knockout weapon. With only six stoppages in 27 fights, Warrington will have to box perfectly to beat some of the better fighters in the featherweight division. He would have to be one slick defensive guy to outbox Gary Russell, Jr., Carl Frampton and Leo Santa Cruz, and that's certainly not his strength in the ring. But he's an honest, blue-collar boxer that will give it his best in every fight. 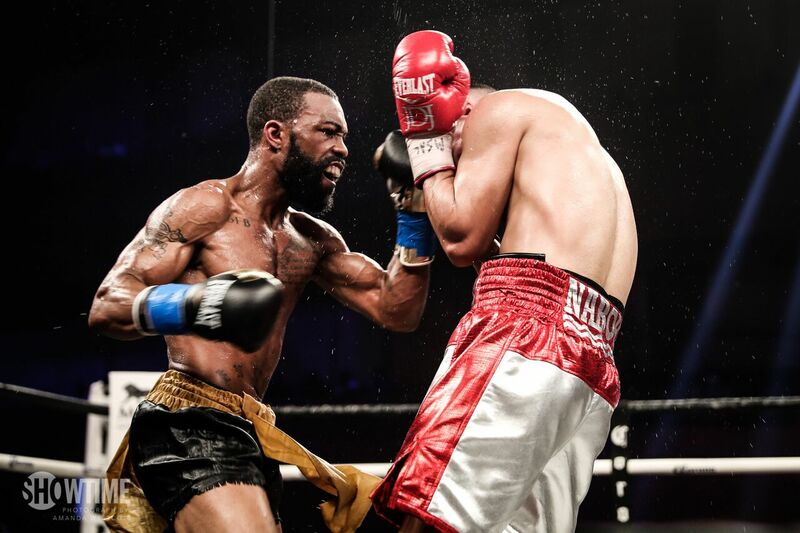 The first half of Saturday's featherweight title bout between Gary Russell, Jr. and Joseph Diaz was outstanding. In a battle of former U.S. Olympians, Diaz punished Russell to the body with right hooks while Russell landed flashy combinations. It looked like fight fans had a war on their hands. But then Russell used lateral movement and struck first in exchanges – and that was pretty much it for Diaz. After 12 rounds, there was no doubt that Russell was the superior fighter. Diaz couldn't match Russell's punch volume or fast hands. Russell would win a competitive unanimous decision in one of the best performances of his career. He completely defanged Diaz in the second half of the bout, taking away Diaz's right hook and with that, his confidence. Ultimately, it was a strange performance from Diaz, and one that smacked of a lack of preparation. It's not just that he couldn't get anything done from the outside, but he didn't even try. He certainly has a competent jab and an accurate straight left hand, but those punches were glaringly absent on Saturday. Diaz and his father (who trains him) had no Plan B. Diaz essentially followed Russell around the ring for most of the second half of the fight, eating combinations and refusing to let his hands go. Belatedly, he came to life in the final frame, but by then it was too little too late. Despite considerable hype, Diaz never struck me as a true blue chip prospect. Lacking elite punching power and athleticism, Diaz won most of his development fights with punch accuracy and boxing skills. But there was nothing particularly special about him in the ring, no one punch or facet that demanded attention or generated excitement. I also believe that he didn't have the proper seasoning going into his first title shot. You won't find a single slick boxer on Diaz's resume prior to fighting Russell, and it certainly showed in the ring on Saturday. He seemed woefully unprepared for Russell's style. It's almost as if Golden Boy didn't have full confidence in him during his developmental period. Why not expose Diaz to that style prior to getting his title shot – especially when Diaz was gunning for Russell's belt! Of course, there's no guarantee that if Diaz was developed better he would have beaten Russell, who is supremely talented. However, I don't believe that Diaz was put in the best position to succeed on Saturday. That's on his promoters, his team and Diaz himself. Everyone wants to get the title belt and the spoils that come along with it, but short-circuiting development is a risky proposition. Sure, it can work (Errol Spence, for example), but it can also lead to performances like Diaz's on Saturday – a young fighter facing a crisis of confidence, and without the reservoir of experience to make needed adjustments. Adonis Stevenson and Badou Jack fought to a draw in a light heavyweight title match on Saturday, and it was a just verdict. Jack, wary of Stevenson's left hand and his own chin issues early in fights, refused to engage for most of the first half of the bout. In round six, he opened the floodgates and roughed Stevenson up throughout many of the latter rounds. A well placed body punch by Stevenson in the 10th hurt Jack, but by the 12th, Stevenson had to survive to make it to the final bell. It was a tale of two halves and neither fighter should be satisfied with his performance. Stevenson, 40 and pudgy in the mid-section, looked to be in terrible shape. By the seventh round, his tank was on empty, despite minimal pressure from Jack up to that point. With only two competitive rounds in the past 22 months, his reflexes were poor and his shots lacked crispness. His counters were off; his holding was excessive. Jack was clearly better on a punch-for-punch basis; however, that's not how fights are won. Throwing 15 shots in a round isn't going to get it done. He will look back at the first half of Saturday's fight with disappointment, knowing that the bout was there for him to win, and he came up just short. Ultimately, Jack helped to defeat himself. Paying too much respect to Stevenson early in the fight, he let the older, inactive fighter set a comfortable pace. He spent so much time avoiding Stevenson's left that he forgot to do anything offensively. Jack's trainer, Lou Del Valle, seemed pleased with their tactics. However, giving away five rounds leaves too little margin for error. 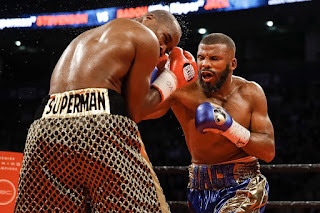 And furthermore, Stevenson was in such horrid physical condition that had Jack decided to start two or three rounds earlier in the fight, he most likely would have been able to get the stoppage. Jack now has draws, majority decisions or split decision wins against Stevenson, James DeGale, George Groves, Anthony Dirrell and Lucian Bute (this verdict was subsequently changed to a disqualification victory for Jack after Bute failed a drug test). On one hand, these results demonstrate that Jack has been able to compete with the best at super middleweight and light heavyweight. However, the close scores also indicate that Jack has problems creating separation against good fighters. He takes rounds off. He can be a slow starter. In addition, he seems unfocused during portions of fights. Jack had a wounded champion in front of him on Saturday and couldn't finish the job. He let DeGale survive the 12th round, enabling him to escape with a draw. Inexplicably, he allowed Bute back in to their fight during the latter rounds. Jack possesses the physical tools to be elite but he lacks a killer instinct. This is a serious shortcoming. At age 34, Jack is by now a finished product in the ring. He rips body shots and throws sneaky combinations. He's a tough hombre and no one will enjoy fighting him. However, he gives opponents opportunities and can beat himself. It would be silly to count him out in any particular fight at light heavyweight, but it would take a giant leap of faith to suggest that he will emerge as the top guy in the division, not with his flaws. As for Stevenson, I guess we are stuck with him for at least one more fight. Possessing the best straight left hand in the sport and a Kronk boxing education, Stevenson could have become a big money fighter. Instead, he was comfortable facing lesser talents – that is, when he could be bothered to get in the ring. Passing up millions of dollars to fight his top rival, Sergey Kovalev, Stevenson is a reminder that not all boxers are motivated to be the best. For some, the sport is just a career, a means to end. But as the end harkens for Stevenson, few will shed tears. He will retire as a footnote, and I doubt that will bother him.